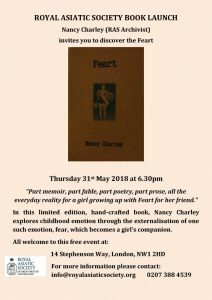 Nancy Charley, RAS Archivist will launch her new poetry collection, Feart. This limited edition, hand-crafted book, explores childhood emotion through the externalisation of one such emotion, fear, who becomes the Feart, a girl’s companion in the trials and joys of growing up. Please join us for the evening in which Nancy weaves some of the pieces from this collection into a poetry-telling narrative.